Melted Tire Bead Cuts Ray Black Jr.'s Phoenix International Raceway Return Short - Ray Black Jr.
AVONDALE, Ariz. (November 13, 2016) – NASCAR XFINITY Series (NXS) driver Ray Black Jr.’s return to Phoenix International Raceway was cut short Saturday night, as a melted bead in his right front tire caused the No. 07 ScubaLife.com Chevrolet Camaro to slide up into the outside wall and cause race-ending damage. Black and his SS Green Light Racing team worked hard all weekend long with a tough-handling racecar. 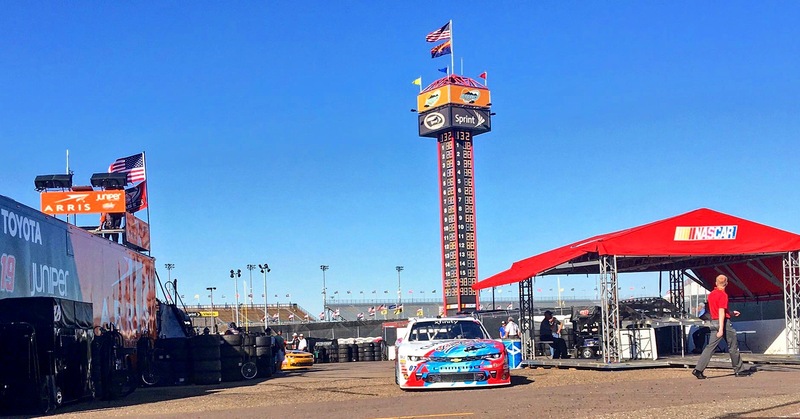 Throughout both of the weekend’s practice sessions, they fought hard on loosening up an extremely tight Chevrolet. After qualifying 27th for Saturday’s Ticket Galaxy 200, Black and the team continued to try to loosen up the car throughout the main event. As the leaders set a blistering pace on the field, Black knew his team would have to gamble with strategy to gain track position throughout the night. With a caution coming out on Lap 93, Black and his team decided to roll the dice and take a wave around instead of coming in to pit in order to get back on a more competitive lap. The team was certain that they would be able to pit at a later caution to loosen up the car a little more to Black’s liking. Unfortunately, just over 10 laps later a bead on Black’s right front tire would melt and cause him to slide up into the outside wall. The damage would prove to be too much for the team to repair and end Black’s night early. He would go on to be scored in 36th place. Next up for Black and his team is the season finale race at Homestead-Miami Speedway on Saturday, November 19 at 3:30 p.m. EST. Fans can keep up with Ray Black Jr. on and off the track by following him and his sponsor, ScubaLife, on Facebook, Twitter and Instagram at @TeamScubaRacing and @RayBlackJr.